Child Dies After 21 Vaccinations in 5 Months – PLEASE READ! 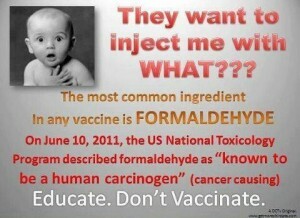 Important read no matter if you are pro or against vaccinations. Reports have just been released of a South African infant and her parents’ painful ordeal after more than 21 vaccinations over five months left the new parents childless. After the first round of vaccines the parents noticed baby’s legs had grown swollen and hardened for several weeks following. The doctor kept record of the reaction but reassured mama that it was nothing to be alarmed about. She was instructed to cover the infant’s legs with a warm washcloth and massage. and a vaccine said to protect babies against pneumocococcal and non-typeable haemophilus influenzae disease, Prenevar/Prenvar. Does this cocktail of toxins seem slightly taxing for a five month old? PreviousCheck out this Comet ISON interactive model – This is REALLY Cool!